One of the greatest luxuries the auction/garage sale/estate sale format provides me is people watching. I love people watching. And ultimately, I love people. Big people, little people, different colors, different appearances, etcetera. But the thing I like most about people is their comedic presence…their quirky eccentric true-self that somehow eases its way out that even the most polished individual can’t squelch. It’s that goofy commonality that, even though we perceive ourselves as individuals: rich, poor, fat, skinny, smart, dumb…it somehow links us back to each other, making you realize we all do the same stupid…uh…stuff. In case you are confused, I’ll give you a quick example. Ever see someone slip on ice? Ever slip on ice yourself? Funny as hell isn’t it? No matter where we are mentally when it occurs, we pause for a brief slice of time to flail and fight gravity and no matter whom you are, you become instantly the same as everyone else who has ever slipped on ice: a goofball. How about when you are sitting next to a vehicle in traffic and the car next to you starts to move, but you can’t tell if you are moving or if they are. You become dumb as a brick don’t you? How about when you check your watch to see what time it is. A friend sees you do this and they ask you what time it is…and you can’t remember the time YOU JUST CHECKED! HA! Ignorance may be bliss, but not when you are quite aware of it. I also like the aesthetics, to be kind, of people as well. Now let me preface…by all rights I am a goofy looking guy. I am 6’1″ and probably nearly as broad as I am long. I wore a size 13 shoe when I was 13 years old, then graduated to a size 14 when I was 14 years old, and have been holding steady ever since. I have a good head of hair, but it never gets long. When it isn’t properly attended to, it morphs one of two ways: either it “fro’s” up, I mean straight up…Don King up, or it turns into what Jill likes to call evangelist preacher hair. Preacher hair is that extra tall, uber-fixed hair that the Sunday morning talking heads sport whilst delivering their fire-and-brimstone sermons. Although mine isn’t the obligatory silver fox color yet, antiquing or Jill may soon be the culprit if that life change does take place. Since I prefaced by saying I too suffer from chronic goofitis, then I don’t feel as bad poking fun at others for their, ahem, aesthetic oddities. One more thing on the subject and I will get on with my story. I don’t take pleasure in other people’s misfortunes. For instance, if someone was horribly disfigured or something of the like, well that’s just not funny. The aesthetic funny I am talking about is obvious life choices to project yourself a certain way. Take me: if I came to your house with my big foot and gangly stature wearing clown shoes (although they practically are anyway) and spandex, well fell free to jest your fill. The target auction today was to be held at night. Most of the time we focus on early morning auctions which we believe will give us a full day of lookin’ and buyin’. Night auctions offer their own challenges. Usually nighttime auctions are held by auction-houses and although they have lots of good stuff, it rarely affords us the ability to purchase since most people raising their hand during evening auctions are bidding for items to place in their own home. We arrived a few minutes late due to a slight miscalculation by the Geep-us, the nickname we’ve given to the GPS. I rustled up a bid number, Jill did a quick scan of the items and we both met somewhere in the middle to choose our seats, a standard practice we have repeated dozens and dozens of times. The auction house was full of characters, a very animated auctioneer and filled to the rafters with the smell of popcorn and soup beans. I immediately liked the place. We sat in front of a group of older gentlemen who gave a running commentary of the auction. They reminded me of the two old guys in the balcony on the Muppet Show. There were a couple of ring men that helped catch bids and deliver items to the crowd, via “right field” or “left field” as the auctioneer described direction. The auctioneer himself was wearing a cowboy hat and spectacles. I referred to him as “Tex with Glasses.” When he wasn’t calling the auction he was relatively quiet, a rarity for auctioneers. I have found that once an auctioneer chooses a profession in which he must talk fast, it’s tough to exit that speech pattern. But this auctioneer left the talking to one of the ring men who also had a microphone, another rarity in the auction world. 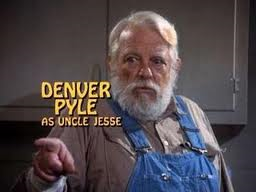 I affectionately called that ring man “Uncle Jesse” due to the similarity between him and the Dukes of Hazzard character. He had the same white beard, the same blue-jean overalls and the same half-moon belly rounding out the overalls. He was funny. It was all I could do to stay in my chair when he belted out his unintentionally comical one-liners. “Folks, thanks for coming tonight. Without your bids we wouldn’t have an auction.” Tex with Glasses nodded in solidarity. Lawn darts came across the block. We missed out. Then we got a pair of so-ugly-they-hafta-be-cool chairs. They didn’t look too heavy which, as being the designated muscle, was good for me. While Jill calculates the amount we have spent at auctions, my litmus test was assessing the weight of a particular object. If we were paid by pounds I sometimes feel like I would be a millionaire already. Next was a damaged coffee table, the same one we have in the store. The damaged one went for nearly as much as ours, which is in pristine condition! Amazing how values can be so different in just a short distance. Two more ring men were running items back and forth, creating a festive scene of items carried over top of peoples’ heads, of stuff entering and leaving the auction block and of Uncle Jesse constantly telling a tale, expressing gratitude or describing the condition of a particular piece. The next item was an old radio pre-tuned to a county music channel. He fired up the unit and when the sweet sounds of hillbilly rock bellowed from its innards, the bidding inevitably increased. The ring men themselves were comical. One had a chiseled lower chin that seemed to constantly fight with his upper jaw producing a little I-know-something-you-don’t grimace. The other, a considerably older gentleman, although you wouldn’t know it watching him dart sold items to and fro with lightning speed, had a Band-Aid on the right side of his head and sported a “Coroner’s” vest. In my own mind I chuckled at the thought of how the two adornments were related. Due to his speedy demeanor, had he reacted too quickly as coroner and, after trying to zip an innocent bystander into a bag, received his mid-head injury? I never got the nerve to ask. Besides, my wit isn’t for everyone and I was well outnumbered. I feared retribution from a man who obviously knows how to get rid of a body. The items began to slow and I started loading up. I did catch one final Uncle Jesse-ism while moving purchases to my waiting Suburban. “Well now folks I tell you what…this is ’bout ret-ta-row as I’ve ever seen.” Jill bought a couple of ret-ta-row items on principal. And if you come to our shop, we have both styles…Retro and ret-ta-row. Now I have to warn you, ret-ta-row is rarer, thus a little more expensive, but I think worth it. All razzing aside, that was about the friendliest auction house I have ever visited. On average, the auctioneer said a heartfelt thanks for coming or thanks for bidding after every fifth or sixth bid, especially when there was a little bidding war going on. Even the Domino’s Pizza across the road was amazingly friendly. After a jovial message stating the location and specials, I was transferred to a person. “Thank you, sir. And thanks for calling Domino’s Pizza. And may I say, I hope you have a wonderful New Year!” Like I said, very friendly town. Everyone seemed to like that auction house. We sold most of the items we won within days of the auction. Their price was accommodating, allowing our price to match. We will definitely make the journey back to what must be the friendliest auction house in America. Who knows, if the town in anyway matches the attitude we experienced at the sale, well, me might just have to file it away as a possible place to retire.